Whether or not ancient Egyptians had access to advanced technologies that allowed them to use batteries and electricity thousands of years ago is something firmly debated –and considered ludicrous by many archaeologists around the globe. However, there seem to be numerous pieces of evidence which suggest its very possible. However, it seems that there are numerous discoveries in ancient Egypt that firmly point towards a forgotten piece of ancient Egyptian history. Just how did the ancient Egyptian create the pyramids of Giza? How did they transport huge, megalithic blocks of stone across the desert? And how did they create some of the most fascinating artworks in numerous temples without light? Interestingly, there are numerous findings that indicate ancient Egyptians might have had access to advanced technologies, thousands of years ago. Two of the most prominent pieces of evidence is a wall at the Dendera Temple and the enigmatic Baghdad Batteries. We start off taking a look t the enigmatic Baghdad batteries also referred to as the Parthian batteries. The items were discovered in the village of Khuyut Rabbou’a in modern day Iraq. These mysterious terracotta pots are around 115 mm wide to 140 mm tall. The batteries remained long forgotten until Wilhelm König, the director of the National Museum of Iraq found the Baghdad batteries in the museum’s collections in 1938. Wilhelm König was among the first to speculate that these items were, in fact, batteries in a paper published in 1940. Surprisingly, researchers have found out that lemon juice, grape juice, or vinegar was used as an acidic electrolyte to generate an electric current. Moreover, experiments with models of the Baghdad Battery have produced between 3 and 5 volts. It is not a lot of “juice” when you look at it but then again, it was enough to power “something” small, thousands of years ago. These Batteries are unique; they are a discovery that is one of a kind. It is something that tells us that ancient mankind had the technology and that they were not as primitive as we thought. Is it possible that these batteries were used to power devices such as the “Dendera bulb”?According to Ancient Alien Theorists, the answer is yes. Curiosity and surprise have been present when trying to figure out how did the ancients in Egypt achieve their artistic and technical perfection in total darkness in the immense underground corridors that are found in countless monuments in different necropolis through Egypt. Just how did they manage these incredible feasts without a constant light source? That is a question that has been partially answered by archaeologists and historians, but these theories haven’t been accepted by everyone. But what if electricity of modern times is actually a reinvention thousands of years old? 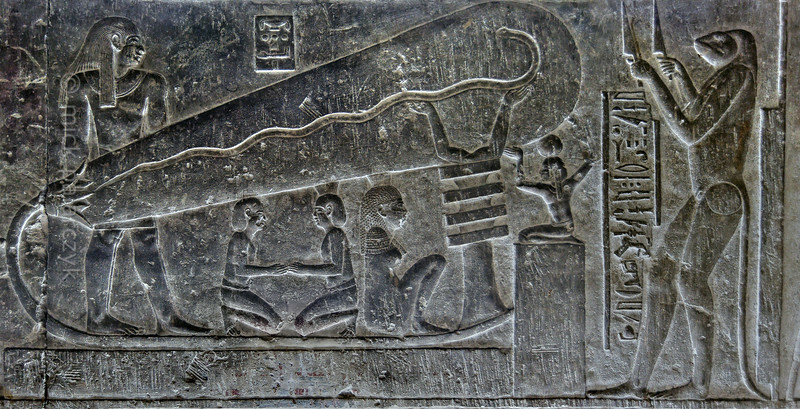 Is it possible that electricity was originally discovered in the ancient world, and the Egyptian priesthood was the first to harness the power to illuminate their underground tombs and monuments? Many people around the globe say yes and point to a series of reliefs covering the walls in a dark corner of a crypt in the temple of Hathor at Dendera.